Christian Aid are organising what is called a Mass Visual Trespass - a projection of text, video and photo messages from members of the public to be projected in a place where Gordon Brown can see them. The trespass is calling on Gordon Brown to help deliver climate justice for the world's poorest people at December's crucial Copenhagen summit and begin to see the world changed. In this morning’s gospel reading, Jesus asks the Pharisees, the crowd, the disciples, Gordon Brown and us what sort of world do we want to live in and are we prepared to live our lives in such a way so that change is brought about in our hearts, heads, hands and indeed into our whole lives. Jesus is out in the countryside teaching the crowd and his disciples and teachers of the law come from Jerusalem to find him. Why did they go out there? To try to discredit Jesus? To suss him out? Whilst they are there they notice that the disciples are eating without washing their hands. The disciples are not in breach of the Law by not washing their hands, but they are breaking with tradition. The fact that Mark has the little aside about what the tradition actually entailed, and that he records the Pharisees when they are in conversation with Jesus talking about the ‘tradition of the elders’, might mean that Mark was writing and Jesus was speaking to a crowd that was largely made up of non Jews who will have needed the explanation. Perhaps that is why the Pharisees were there - they had heard that Jesus was teaching Gentiles as well as Jews. Jesus sidesteps the question about breaking of tradition and instead, he sees really where the Pharisees are at. To Jesus it felt like the importance of these traditions of the Law had become more important than the Law itself. Jesus quotes Isaiah from memory and accuses the Pharisees of teaching others to do as they do - honouring God with words and actions alone but not with holy lives. The discussion that Jesus had with the Pharisees begins with the washing of hands, and the implications of things that I have touched or not touched have on on my own spiritual wellbeing. I can see how this tradition began and it is a very 21st century one. 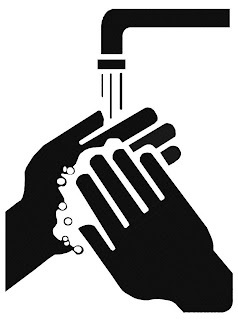 In an age obsessed with swine-flu and antibacterial cleanliness how we use our hands is a physical and spiritual issue. The discussion that Jesus had with the Pharisees ends with a call to a radical obedience, as the encounter ends asking questions about not just about my spiritual wellbeing, but about how my whole life honours God. We live in a world that distances individuals from each other - swine flu aside. More and more new homes are being built for a single occupant. Technology allows us to communicate and shop without interacting with another person. When did you last speak to someone rather than email them? When did you last hold someone by the hand and tell them that you love them? In contemporary culture we need to see each other less and less. It is all too easy for us as Christians my friends to find ourselves swept up in the traditions of our day from the way we worship to the way we shop. Jesus asks us - do these truly honour God? Who is it, like the Pharisees in Jesus’ day that is encouraging us - our church leaders, politicians, advertisers? Jesus used his hands in surprising ways to break the traditions of his day with the leper, the syrophonecian or hemorrhaging woman, the poor or blind or even the dead. Touching clean and unclean alike, through the use of his hands the kingdom of God came near.